A violent riot that took place at the University of California, Berkeley has ended, but reactions on social media continue to roll in ‒ including from President Donald Trump, who suggested withdrawing federal funds from the public institution. 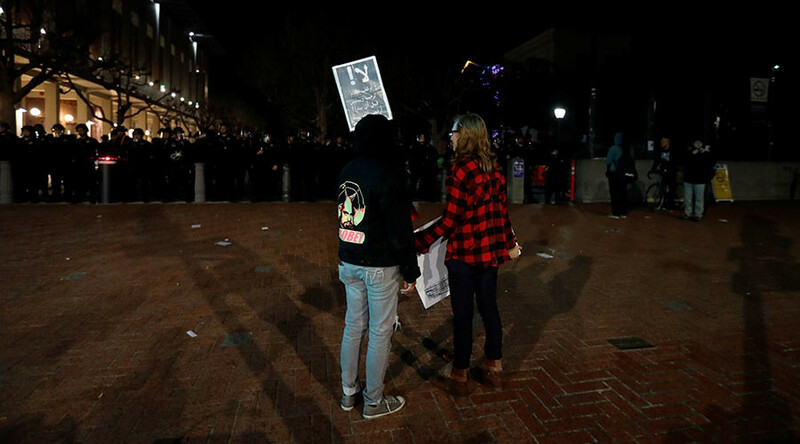 The Wednesday night carnage was in response to a scheduled talk from Milo Yiannopoulos, an editor for the right-wing website Breitbart and a Trump supporter. Berkeley blamed the riot on "150 masked agitators" who interrupted an otherwise peaceful protest, and announced that it had canceled the talk and removed Yiannopoulos from campus "amid the violence and destruction of property and out of concern for public safety." But the university’s handling of the situation didn't sit well with Trump, who took to his favorite social media channel ‒ Twitter ‒ to suggest the institution's federal funds should be pulled if it does not allow free speech and "practices violence on innocent people." Unsurprisingly, Trump’s suggestion was supported by Yiannopoulos' employer Breitbart, who said that current funding at the institution isn't going to "upstanding members of society." Lieutenant Governor Gavin Newsom, who is also the former mayor of San Francisco, was quick to hit back at the notion of withdrawing funds, saying he was "appalled" by the president's tweet. Responding to the general riot, self-proclaimed "urban conservative" Joe Borelli, a New York City councilman, called the actions of the rioters "sad," particularly on a campus that promotes free speech. Celebrities also made their voices heard: “Will & Grace” actress Debra Messing tweeted, "Resistance works!" following the cancellation of Yiannopoulos' talk. When conservative columnist and commentator S.E. Cupp responded to Messing's tweet by saying that "meeting a bad speech with no speech isn't a cause for celebration," Messing replied that "resistance must be loud and powerful now." Berkeley received nearly $420 million in federal grants and contracts in 2015, the last year for which the school’s overall budget is available. For the 2015/2016 school year, the university received $370 million in federal research grants alone. If Trump were to pull funding from the institution, he would need to change the rules governing federal grants and student loans, which are dispensed through the Title IV program, because restricting First Amendment rights isn’t currently one of the ways a school can be booted from the program.